Does someone you know excitedly interrupt others to tell them about things often? Interrupting people is just one prime example of overtalking others. Conversations have to involve both listening and speaking or people cannot communicate their needs. There are 5 ways to stop doing this to the people who you want to actually hear you. We have to use communication to get what we need to not only survive, but to be happy, fulfilled people. Talking too much can make other people avoid you, which will definitely not help you get what you need. 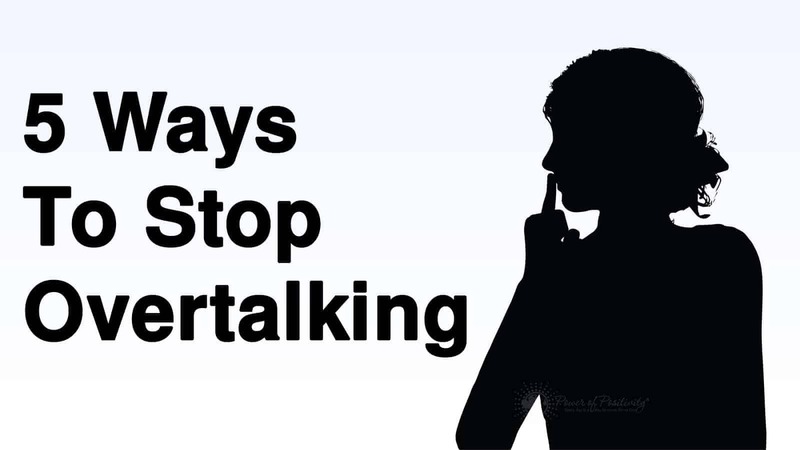 Overtalking is a bad habit that might take some effort on your part to break. As far as who talks more when it comes to gender, women get a bad reputation for overtalking, gossip and talking more than men do. But researchers find that although this is a cultural stereotype, it does not appear to be true. The amount that we talk versus listen is different in different cultures. For example, American professors often think that Asian students are not taking an active role in learning because they speak up less often than students who were raised in a Western culture. Here are some ways to reduce the amount of talking that you do in a conversation, improve your relationships, and be a better listener in service to others. You might think that you can just be aware of yourself speaking and stop, but it is harder than it sounds to stop overtalking. Use your phone to try videotaping your next conversation and then review it to see how you did. This is a great tool for self-evaluation and to help stop overtalking. There was a reason that you opened your mouth in the first place, so stick to the concise, shortened version of that as much as possible. If you get lost and catch yourself overtalking, stop and summarize your main point and then be silent. It can feel good to ‘get something off your chest’ but to unload on someone else just to make yourself feel good is a bad habit of overtalking, and it needs to stop. Researchers call talking about problems with a friend ‘co-ruminating,’ and although it helps to talk things though, talking repeatedly about negative things has also been linked to feelings of anxiety and depression. Find a healthy way, like talking a walk, to relieve the stress that you are feeling when you are just bursting with something to say. Once the emotional stress is worked out of your body, you can calmly talk to someone about your feelings and stop overtalking. When you notice that you are overtalking, ask your partner in conversation a question. By doing this, you put the ball back in their court to speak. Now stay quiet while they respond. A perfect conversation is a mix of give and take in an equal ratio of you and the other person taking turns. This rarely happens second for second, but you may get a sense for how much of the conversation time you take up versus your partner in conversation. On your smart phone, set a timer to vibrate after 3 minutes. If, after 3 minutes, you haven’t stopped talking for the other person to contribute, do it when the timer goes off. Now set it again for 3 minutes and during this time, ask questions or be silent and listen.